Immerse yourself in the fascinating history of the Salem Witch Trials on this sightseeing day trip from Boston. First, visit Marblehead -- the birthplace of the American Navy -- and see Abbott Hall (closed Sundays), listed on the US National Register of Historic Places. As you then explore Salem by coach, your guide will tell you about the infamous witchcraft trials of 1692, as well as the general history of Salem, which was one of the most significant seaports in early America. 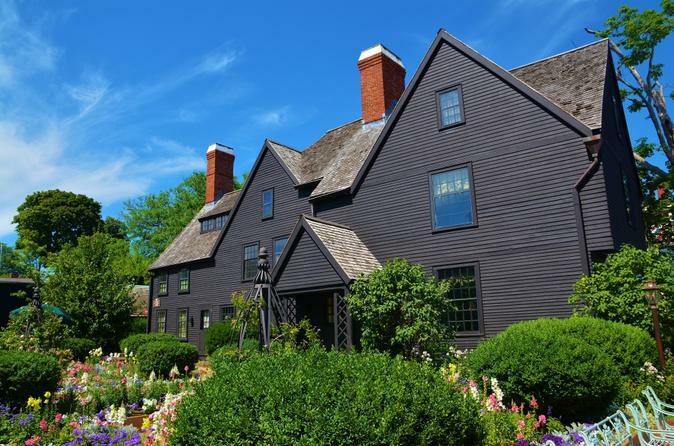 Explore, on your own, Nathaniel Hawthorne's Custom House and the House of Seven Gables, and then enjoy free time to browse kitschy Halloween shops and Wiccan boutiques, tour witch-themed attractions, and visit the Salem Witch Museum (own expense). You’ll be picked up from your Boston hotel in the morning for a 40-minute drive north to Marblehead and Salem by luxury, air-conditioned coach. Along the way, your expert guide will give you a historical overview of this infamous port city that was the site of the infamous Salem Witch Trials. Start your sightseeing adventure with a stop in the coastal town of Marblehead, the birthplace of the American Navy and Marine Corps Aviation and a yachting capital of the US. Visit Abott Hall, a town hall and historical museum listed on the US National Register of Historic Places, where you’ll see Archibald M Willard's The Spirit of 76. Your guide will explain this famous painting's interesting significance. Continue your drive to Salem, one of early America's most significant seaports. It’s best known as being the site of the Salem Witch Trials of 1692, and consequently the subject of Arthur Miller's celebrated book, The Crucible. As you explore the city by coach, you’ll learn about the history of these infamous witchcraft trials, which were a series of hearings and prosecutions of people accused of witchcraft in colonial Massachusetts. As you set off to explore on your own, travel down Derby Street to see the House of Seven Gables and the Custom House, the former workplace of Nathaniel Hawthorne, a famous novelist who was born in Salem. When you reach the neighborhood of Pickering Wharf, enjoy free time to walk around and have lunch on your own. You’ll discover that this city is a mix of important historic sites and kitschy Halloween stores, witch-themed attractions, Wiccan boutiques and a vibrant downtown with more than 60 restaurants, cafes and coffee shops. If you like, you can visit the Salem Witch Museum (own expense) for a more in-depth look at the witchcraft trials. After your time in Salem, relax on the drive back to your Boston hotel. Please note: This tour is seasonal and only operates from June to October. Special Offer - Book and travel by September 16 and save more than 14% off our previously offered price! - Book Now!